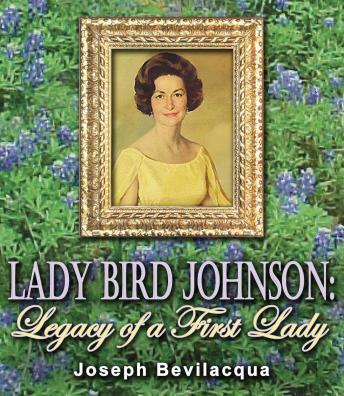 Lady Bird Johnson: Legacy of a First Lady, written, produced, directed and narrated by Joe Bevilacqua. One of the most licensed audio books on The Public Radio Exchange and iTunes, Lady Bird Johnson: Legacy of a First Lady is veteran NPR producer Joe Bevilacqua's award-winning audio documentary examining the challenges and achievements of this extraordinary woman. The hour combines never-before-released archive audio, gleaned from thousands of hours of recordings housed at the Lyndon Baines Johnson Library and Museum, period news broadcasts, private conversations with Lyndon Baines Johnson, and the words of Lady Bird Johnson from an interview that has never before been released to the public. Bevilacqua spent nearly five months listening to the rare tapes and traveled to Washington, D.C. to interview Mrs. Johnson's colleagues and friends. The program features Lyndon Johnson Administration staffers Liz Carpenter, Bess Abell, and Nash Castro, Washington Post owner Katherine Graham, Lyndon Baines Johnson Library and Museum Director Harry Middleton, Lady Bird Johnson Wildflower Center Director Robert Glass Breunig; Lady Bird biographer Jan Jarboe Russell, and First Ladies Betty Ford and Barbara Bush. Other voices heard on the program include Kirk Douglas and Helen Hayes reading from LBJ and Lady Bird's love letters. The production was produced in association with KUT Radio in Austin, TX, and overseen by a panel of scholars and experts including Lewis Gould, retired University of Texas at Austin Professor of History; Walt Rostow, UT Professor Emeritus, Elspeth Rostow, former dean of the UT LBJ School of Public Affairs; Carl Anthony, Washington, D.C. historian; and Don Carleton, director, The Center for American History at UT.